The technically sophisticated flying models also had to be maintained between the flight demonstrations in Hall 3B. 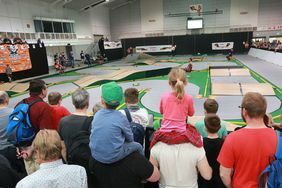 Hot races with RC cars took place in Hall 3A. 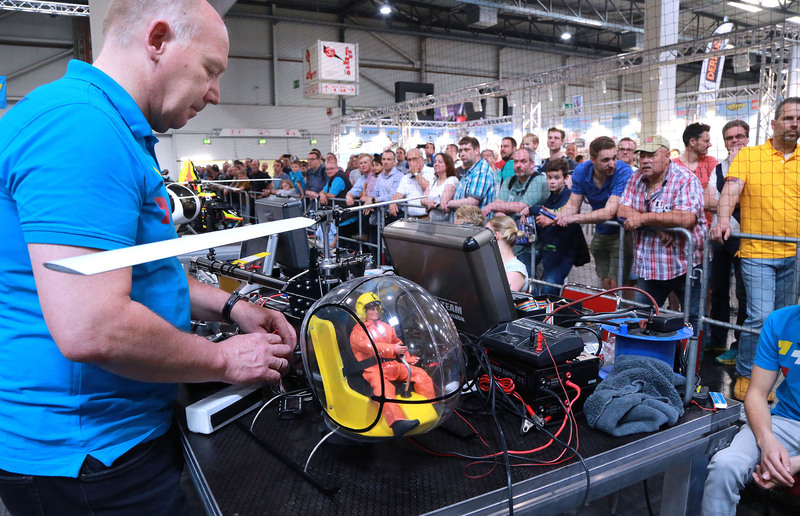 Hall 1 (Westfalenhalle) provided an ideal venue for the FPV multicopter race. A ship was launched in this diorama at the exhibition. 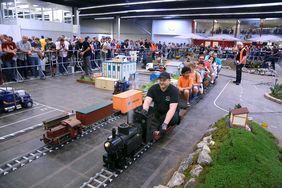 Children could enjoy a ride in a miniature steam locomotive train in Hall 8. Not every diorama must impress with its size. A smart idea can also make the difference sometimes. The quality and the detail of the exhibited model railway layouts were again impressive. Robot Battle in Hall 2N. 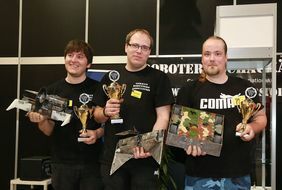 The winners of the Mad Metal Machines contest in both weight classes. 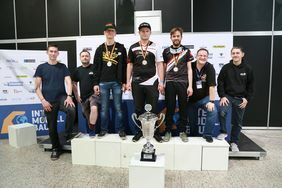 Winners of the INTERCOPTER Racing Cup: 1st place Andy Hahn (centre), 2nd place Nils Brinkmann (left) and 3rd place Timothy Trowbridge (right) with representatives from the FPV Racing Clubs. The INTERMODELLBAU exhibition attracted 77,000 visitors to the Dortmund Exhibition Centre despite very warm outdoor swimming pool weather and a one day shorter duration. The significantly higher number of visitors each day allowed the exhibition organiser to completely fulfil the wish of many exhibitors for reduced time and cost but still offer a multi-day focused platform for contact with an international model-making community. Retailers and manufacturers benefited from a weekend with an extremely high number of visitors. 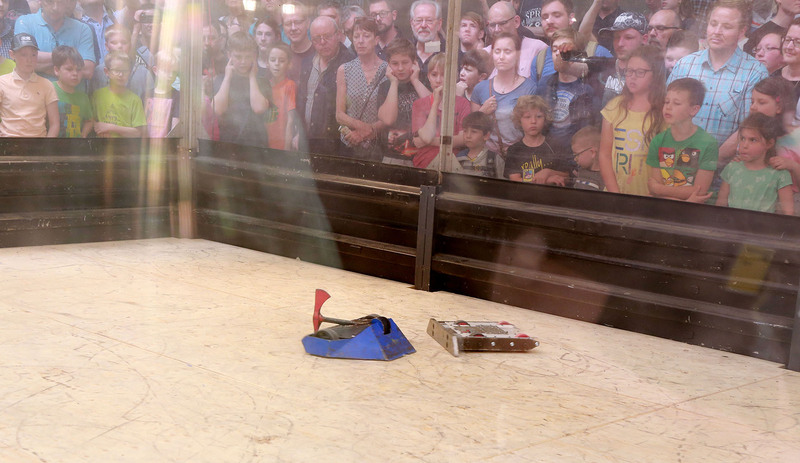 “INTERMODELLBAU has very successfully met this year’s challenge. 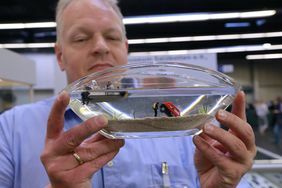 It continues to be the worldwide largest exhibition for model making and model sports,” said Sabine Loos, CEO of Westfalenhallen Dortmund GmbH. 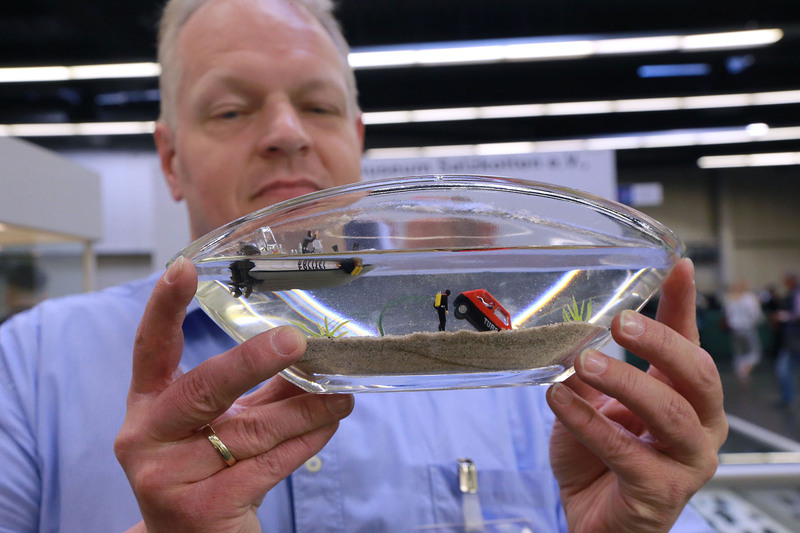 “About 550 exhibitors showcased their products and services at INTERMODELLBAU in 2018 and achieved excellent sales. Good news for the exhibitors: Exhibition sales per visitor significantly increased in 2018. The average spending was EUR 250 per visitor last year compared to EUR 307 this year. 82 per cent of the visitors purchased or ordered something at INTERMODELLBAU 2018. Exhibition sales therefore reached about EUR 19 million. That was the result of a survey conducted by an independent exhibition market research institute. INTERMODELLBAU allows exhibitors to address customers they will not find at any other exhibition because more than 50 per cent of all visitors only go to INTERMODELLBAU and no other comparable exhibition. About 86 per cent of the exhibitors stated that the expectations they had when they came to the exhibition were partly or entirely fulfilled; 5 per cent stated that their expectations were even exceeded. INTERMODELLBAU 2018 was also well received by the visitors. 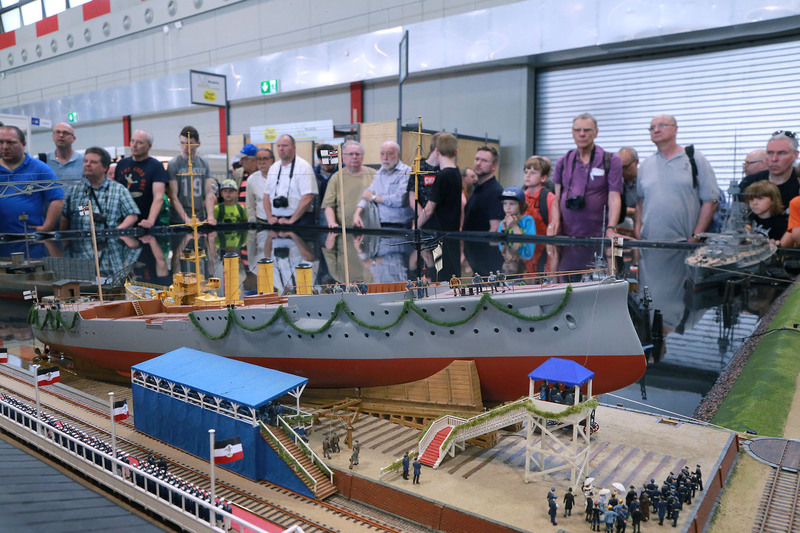 When asked about their satisfaction with this year’s exhibition, the visitors gave INTERMODELLBAU average ratings equivalent to the school mark ‘good’. More than 17 per cent of the visitors travelled to the exhibition from abroad. They came, for example, from the Benelux countries, Denmark, France, Great Britain, Austria, Norway, Sweden, Canada and Brazil. This year, INTERMODELLBAU again attracted visitors from all German states. Besides North Rhine Westphalia, large visitor groups also came from Baden-Wurttemberg, Bavaria, Lower Saxony and Rhineland-Palatinate. 18.5 per cent of the visitors travelled 50 to 100 kilometres, 32.7 per cent covered 100 to 300 kilometres and 19.9 per cent even accepted a distance of more than 300 kilometres. Visitors gave the best ratings of all programme highlights to aeromodelling and the show flights in Hall 3B, ship modelling in Hall 5 and the relatively new programme items, INTERCOPTER Racing Cup and Mad Metal Machines. The most popular product ranges at the exhibition were: Railways, aircrafts, cars and minicars. There was also a great interest in tools, accessories and construction kits. 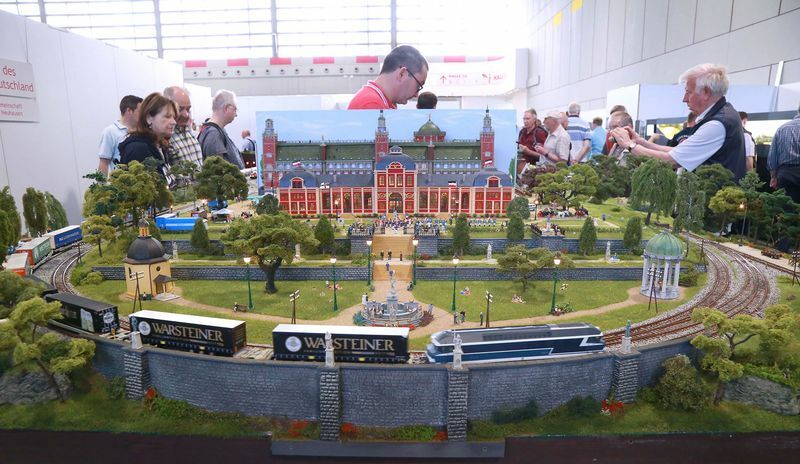 The entire range of products at INTERMODELLBAU was rated by the visitors as ‘good’. 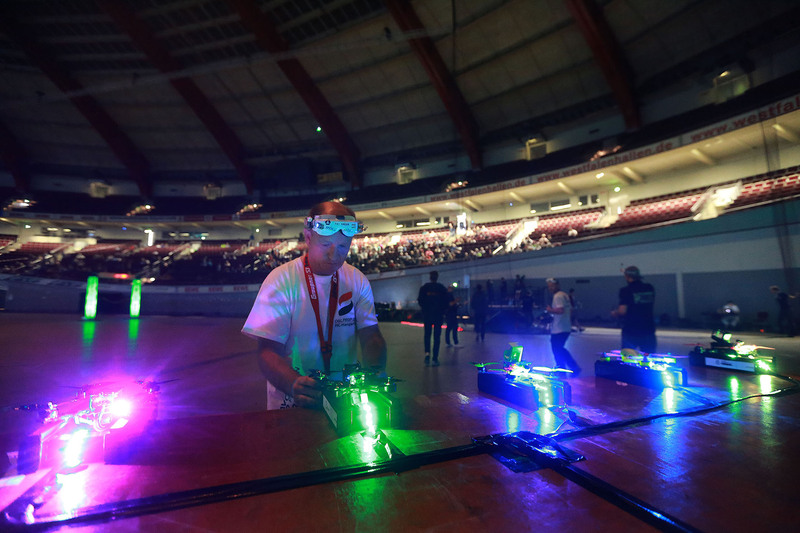 The drone racing introduced in 2017 took place again in Hall 1. 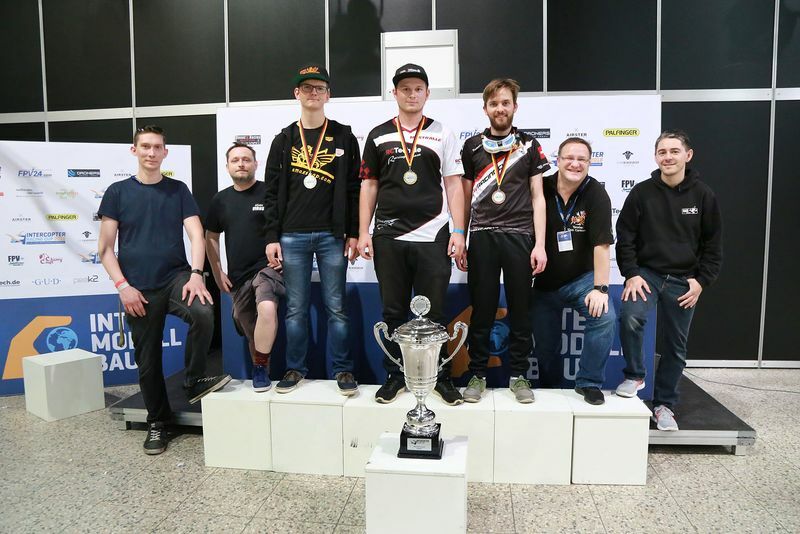 This contest was prepared over many months by the FPV Model Racing Sport Club of the Ruhr Region (FPV Modellrennsport Ruhrgebiet e. V.) and the Rhenish Multicopter Club (Rheinland Multikopter e.V.) More than 100 pilots participated. Besides pre-selected applicants from Germany, Italy, Latvia, Switzerland, Poland, The Netherlands and Austria and last year’s champion Heiko Schenk (33) from Frankfurt, further pilots could qualify for the main race on Saturday during the preceding exhibition days. 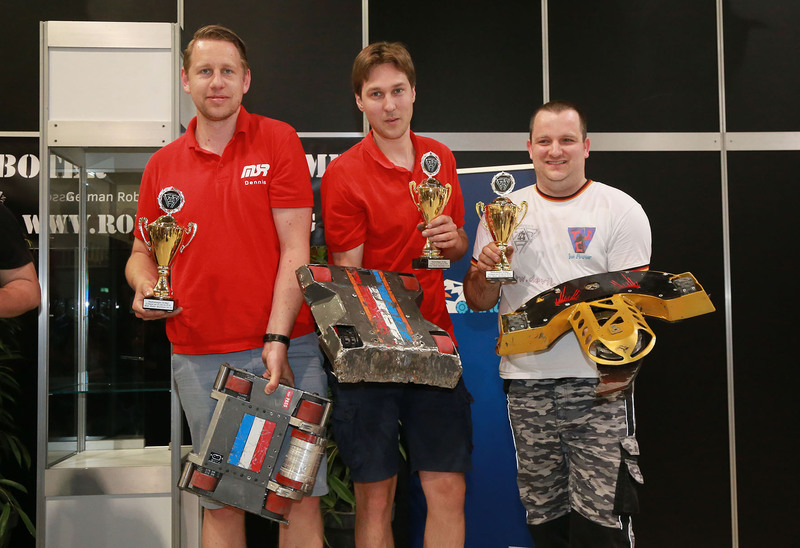 The winners were: 1st place: Andy Hahn from Frankfurt a. M., 2nd place: Nils Brinkmann from Lünen near Dortmund and 3rd place: Timothy Trowbridge from Neerach in Switzerland. Visitors and other interested persons could also watch the spectacular flight manoeuvres via Live Feed in Hall 2 or online via Twitch. New this year: Visitors who wanted to do more than just watch could prove their skills and gain flying experience ‘from a pilot’s view’ with a FPV drone during the ‘Be a Pilot’ event in Hall 2 on Sunday. Raptorweight – 1st place: Lightjockey from Andreas Hollermann from Löningen; 2nd place: Surgeon from Ralf Schneider from Gmünden; 3rd place 3: Rambo from Jonas Fink from Frankfurt a. M.
Featherweight – 1st place: Omega from Stef van Iterson from Amsterdam; 2nd place: Equonox from Dennis Martens from Rotterdam; 3rd place: Anubis von René Hennig from Berlin. 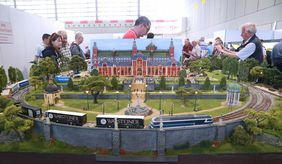 85 per cent of the visitors and 83 per cent of the exhibitors have already decided to come to INTERMODELLBAU again in 2019. Next year’s exhibition will take place on 4 to 7 April.